Jorge Fernandez Rivas. As we find more material, we will continue adding. 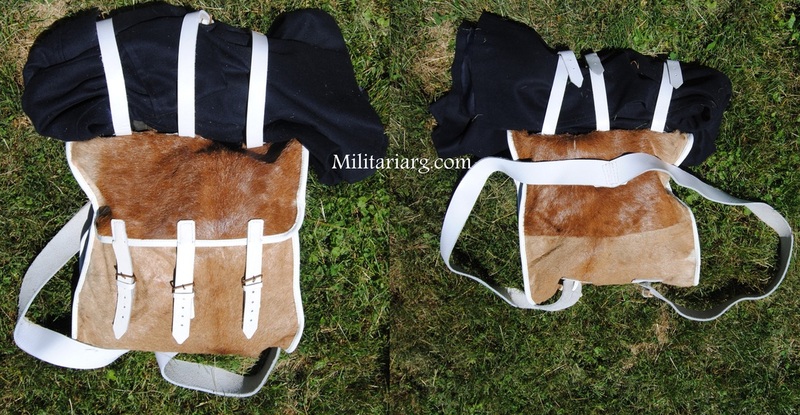 Shako Argentina Guard Battalion of fur and leather apron or apron of sapper (Engineer). Both garments have been in exhibit in the Museum of Lujan. 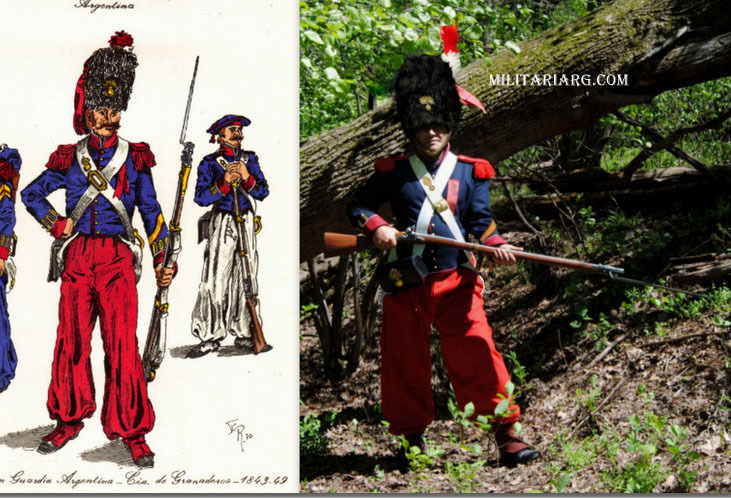 The fur hat is distinctly French style, used by Imperial Guard Grenadiers in their units and horseback riding, and within these units of sappers. The helmet, made of black bear fur, was called in French "Bonnet d'ousin" Beanie Hedgehog. 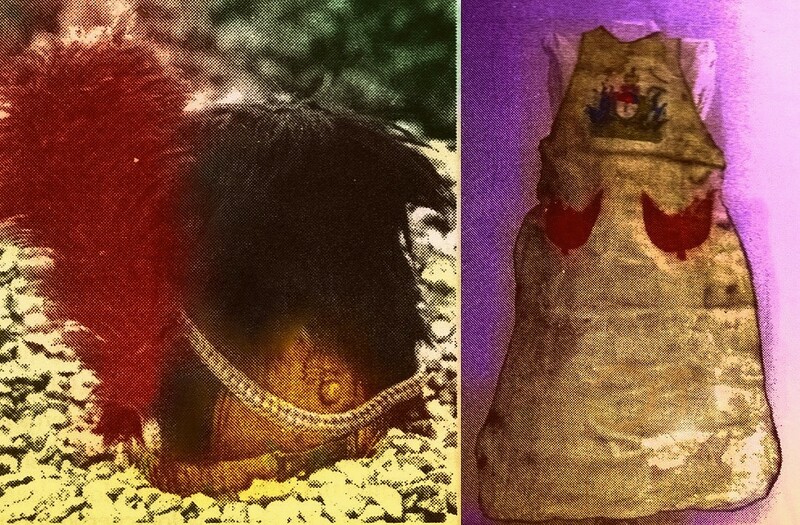 It was adorned with a cord and white pompom, red plume and brass metal front. 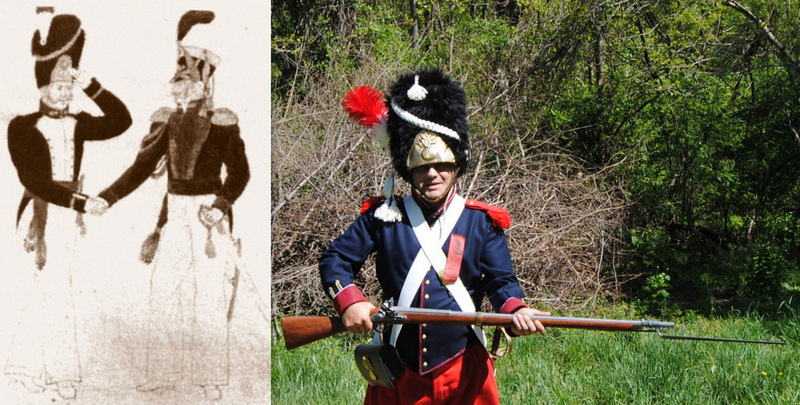 Interestingly, after the Battle of Waterloo, the British loaded into carts those found on the battlefield and used them to his royal guard, successive British helmets were made from Canadian bearskin. In the case of the Confederation of velvety leather bull. Photos: From helmet to helmet Steel. 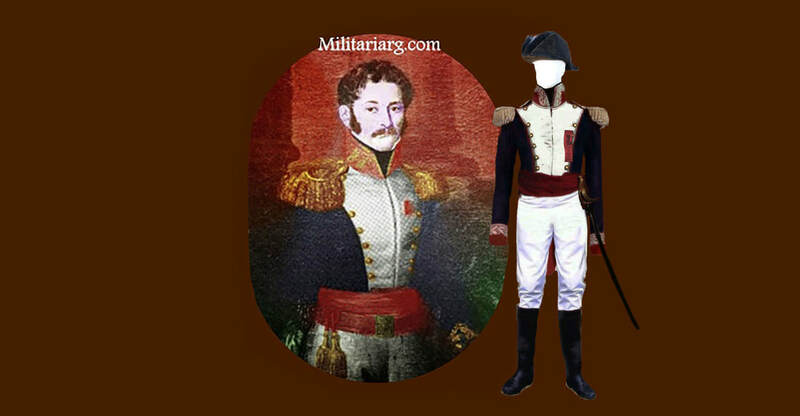 Julio Mario Luqui-Lagleyze, "the military in Argentina History" 1550 - Organization and Uniforms "-1950. National Institute San Martin. 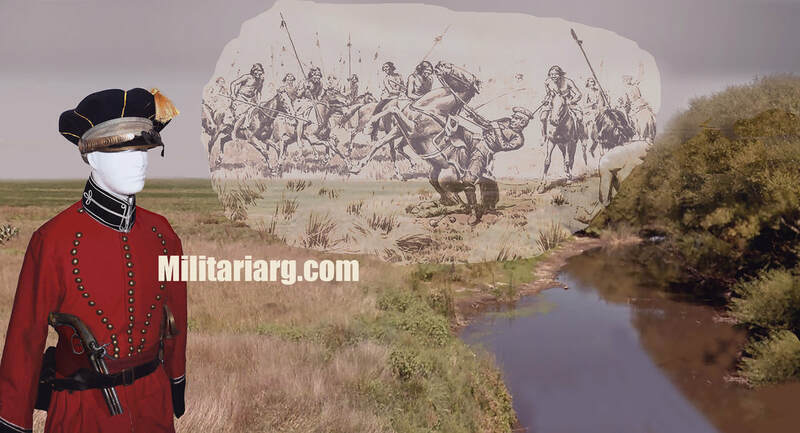 Commission of Military History Argentina. The Argentina Guard is formed on the base of No. 4 Hunters Battalion, which had participated in the war against Brazil. It was reorganized in 1829 as No. 2 Hunters Battalion of the Argentine Guard. 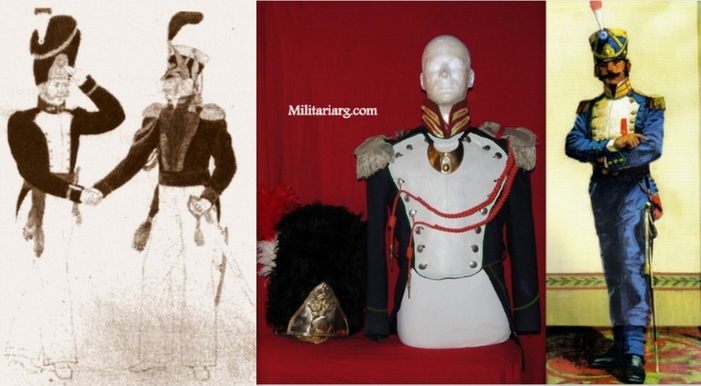 An interesting note is that the uniform was designed by the artist Leon Camara by request of the General Rolon. 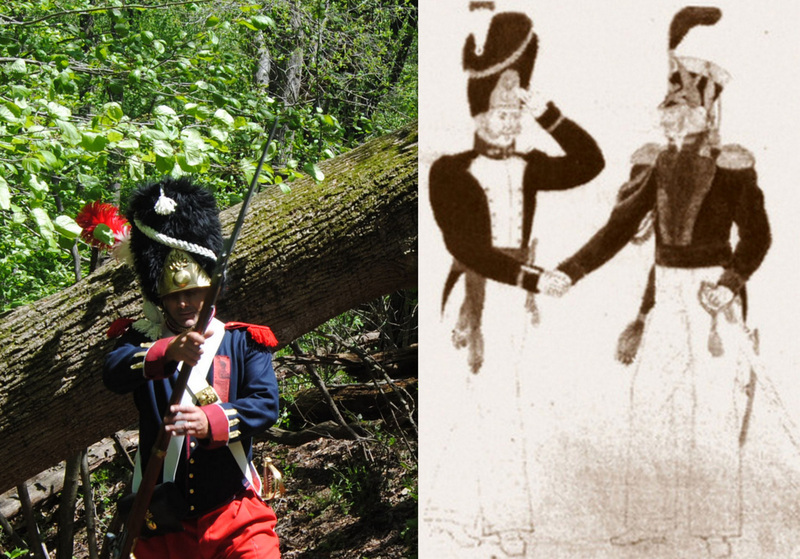 In the middle of the decade of 1840, this battalion had 7 sapeurs (Engineers-Sappers), 16 band sergeants, 32 band musicians, 22 rifle sergeants rifle, 5 sergeants of grenadiers and 254 soldiers. It was still under the command of General Mariano Benito Rolon. 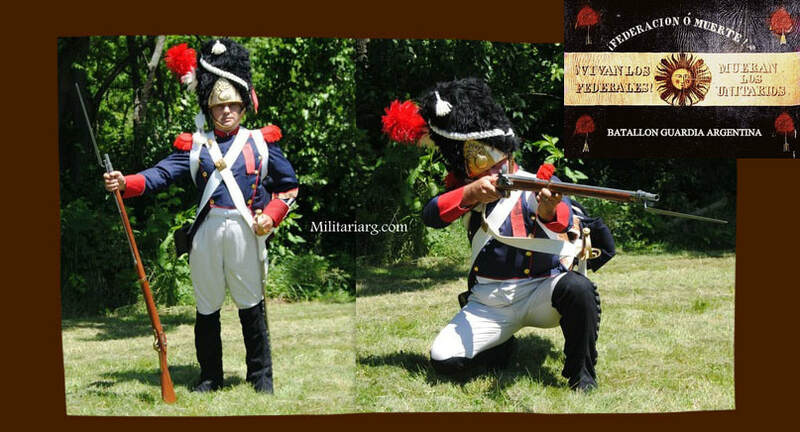 In this recreation, we try to represent an officer's uniform from the Argentine Guard Batallion in 1829. It includes a uniform designed by the artist Leon Camara. 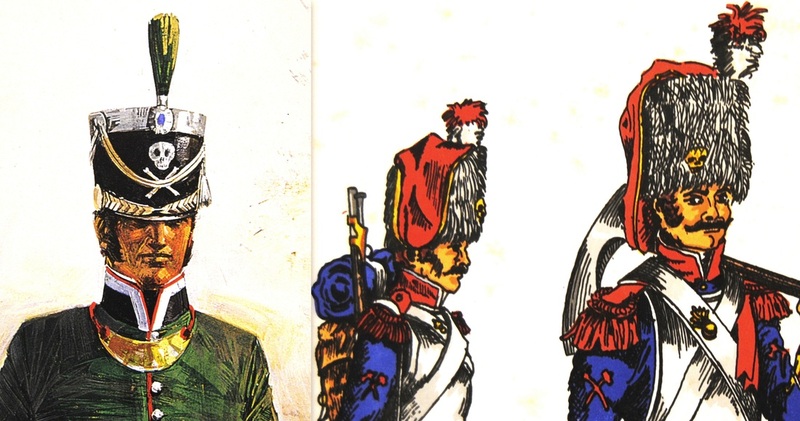 To compare, on each side is a drawing from the era by the artist Joseph Fonteneau (Left) and Guillermo Roux (Right). In the photo in the middle, we use cords (Fourragere) which were held by two points (Aiguilletes), ornament for the Aide-de-Camp. For this recreation I use some French cords from WWII, identical to those from the Napoleon era. They were possibly for "Edecanes (Aide-de-Camp), having been a gold color. ​In this recreation of a Fusiliers Officer of the Batallon Guardia Argentina, the shako has a red horsehair crin.. 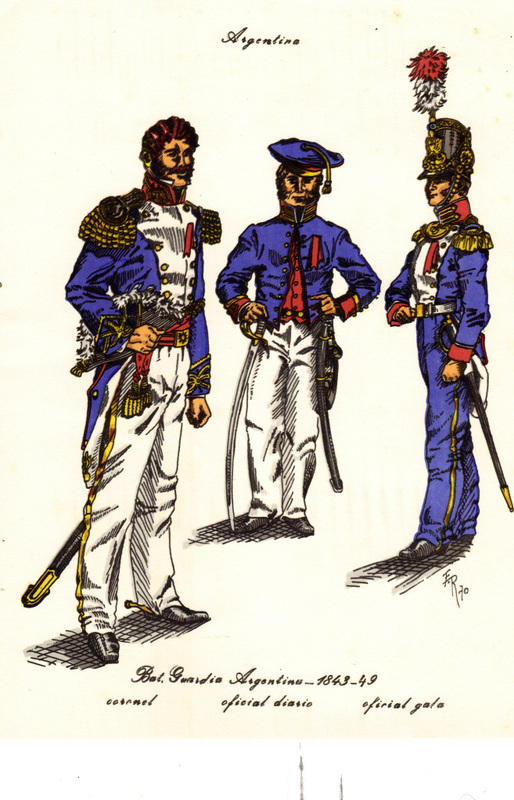 In the Argentine Guard, the Rifle officials used a uniform with blue coats, maroon collar with gold chevrons with white piping, blue bars with deep scarlet and stars. Blue pants with gold stripe. Shako cylindrical with national plated badge, in French style, gold braid, white plume maroon snowflake. On duty officers wore blue jackets open, with blue heels, hats or pie plate with deep blue and maroon band and gold lace. The hunters took three officers in a grenade embroidered chevrons. 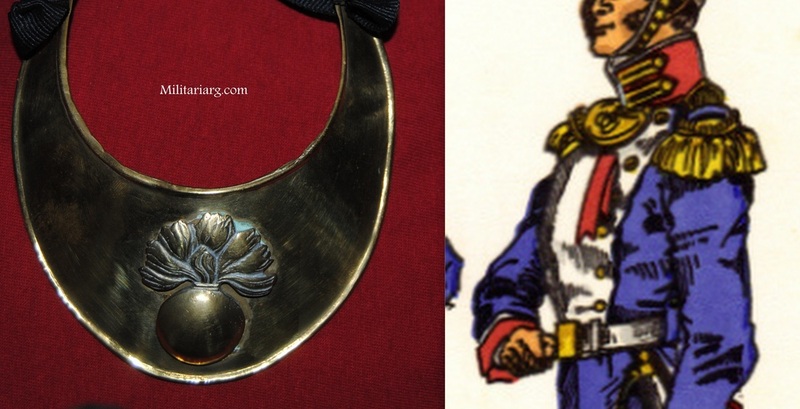 The troops had faith rifle shell blue, maroon cuffs, white piping and gold crescent. Blue pants. 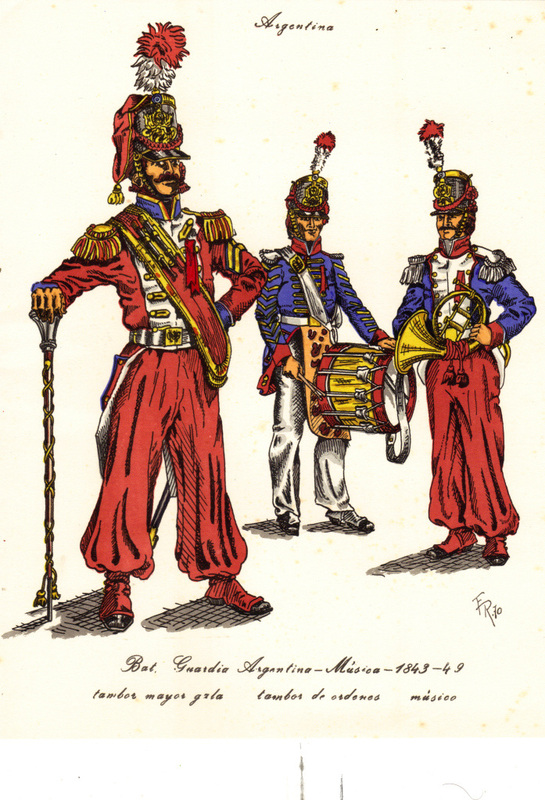 The grenadiers with fur cap which had a white plume sleeve and snowflake garnet ; three chevrons on his fist; maroon epaulettes. 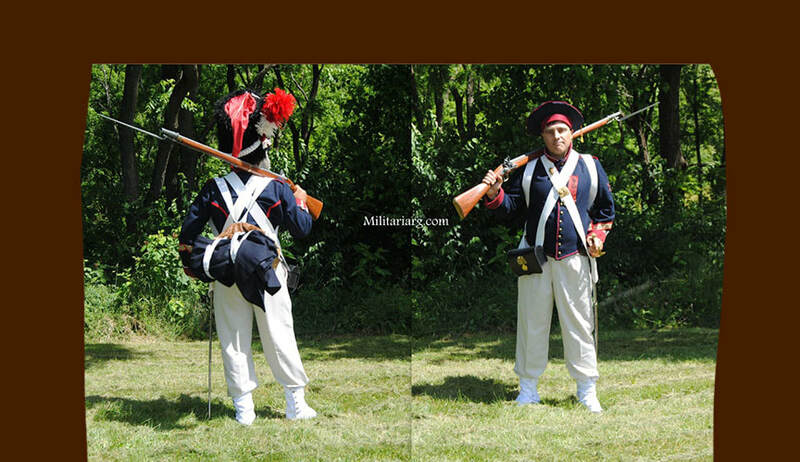 Zouaves type pants, in maroon or white. Hunters like the riflers but with chevrons and bugle fist garnets. Sergeants with gold stripes on collars and cuffs. All had uniform ribbons on the chest (cintillo punzo) which served as identification. They also served to ID those loyal to the government. Officer's Bearskin Shako Replica. 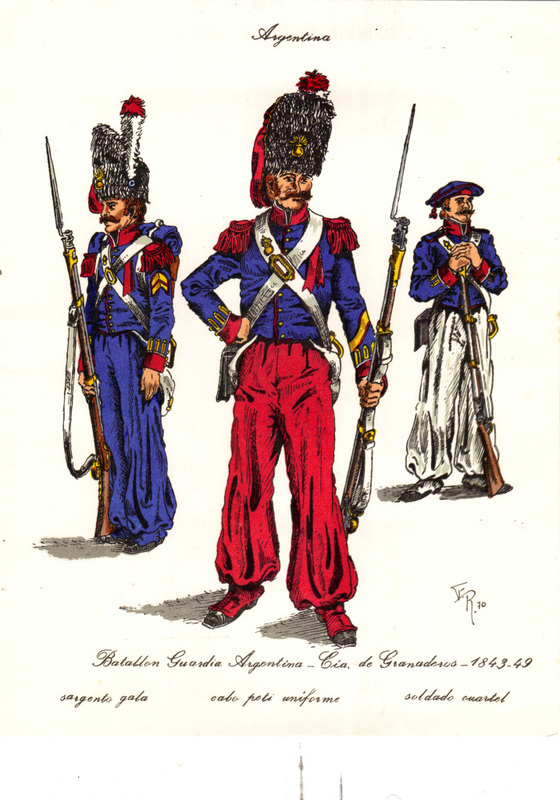 (1791 Type French Foot Grenadier Plate). Repro British Flintlock Musket, colonial or Short Land Pattern. In this illustration by the artist Jorge Fernando Rivas, you can see the saber swords with the head of a rooster (figure of the medium). Until recently I thought that they could be items related to the time of Louis Philippe in France, where the rooster was the national symbol. But in reality this type of grip was correct in the officers of Sapeur of the First French Empire, and possibly earlier. With regard to armament, it seems a Spanish type Carbine from Engineer "Escopeta-Tercerola" circa 1800. ​In the image above, an outstanding saber of pioneer officer of the First Empire, as illustrated by Jorge Fernandez Rivas in the "Gastador 1843 - 1849". 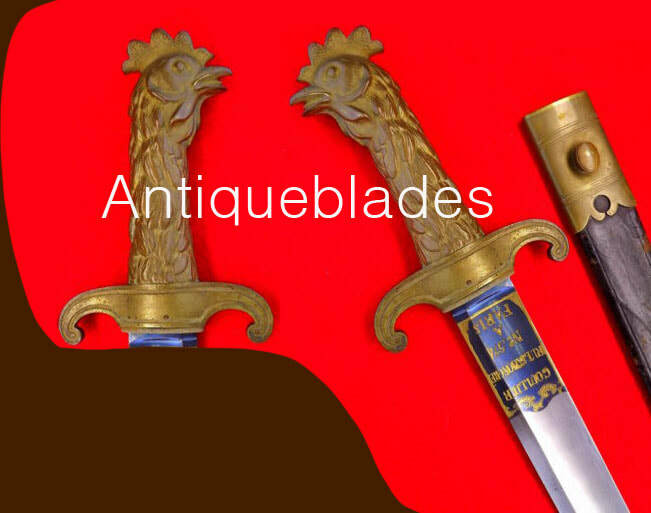 Photo courtesy: Antiqueblades. To get to the item in the photo, just click in the image. 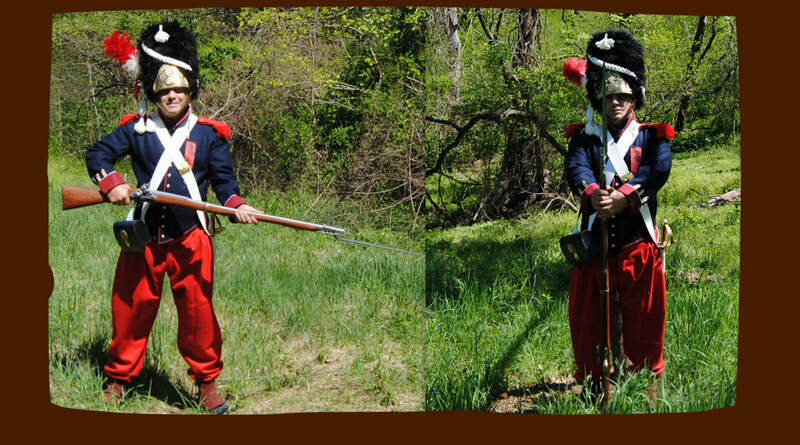 French Spanish 1812 -1820 Infantry Briquet Short Sword Replica. 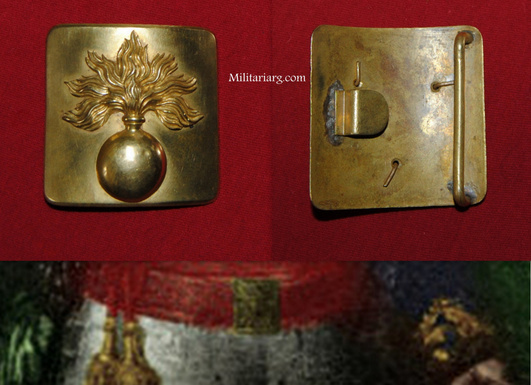 Officer's gorget, grenadier type. Replica. This piece was reminiscent of ancient armor. 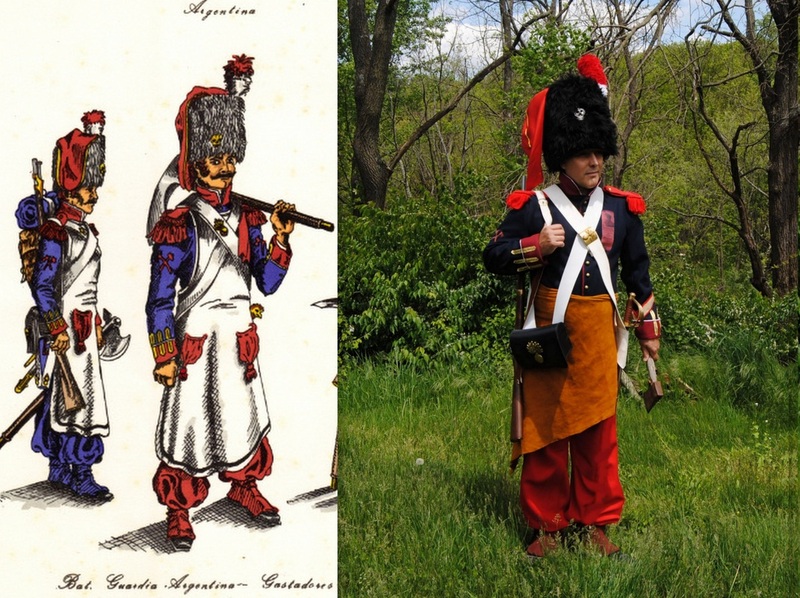 Left Sapeur Officer (1813-14) with shako and skull with crossbones type The Black Brunswickers and British Heavy Cavalry, by Guillermo Roux. 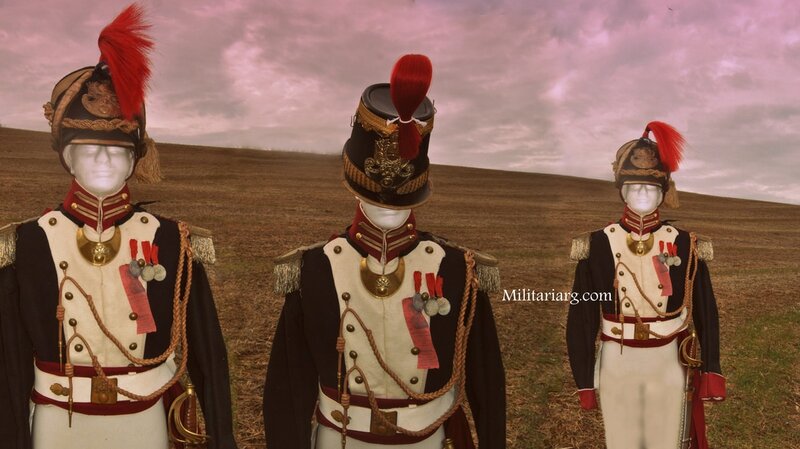 Right Sapeur of the Argentine Guard with the Sapeur Colback and skull by Fernandez Rivas. Black Leather Ammo Pouch Box, Spanish Model 1792. 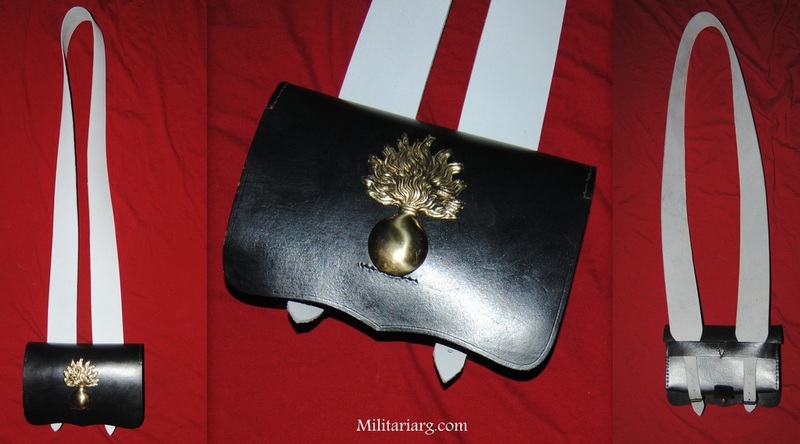 Replica of an 1805 type British ammo cartridge box with grenade badge. The drum major wore a black jacket with back and neck in maroon, blue bars laced with golden yellow, vivid embroidered maroon and grenades. White lapels with 14 sprats in the buttonholes. Fringed epaulettes and gold shovel. Maroon fur cap sleeve. The musicians with similar items, but without braids, short jacket or chevrons. Fringed white garnet epaulettes. The drums in a similar way to the last, with chevrons on the sleeves of white tape. 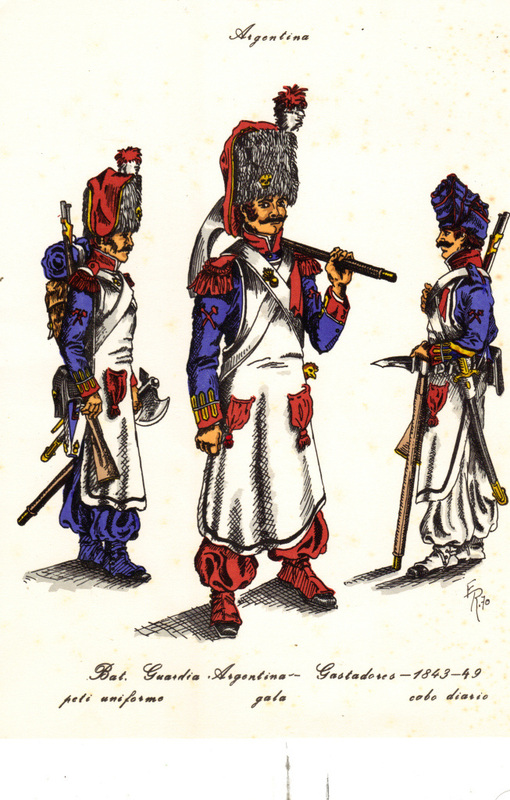 They differed according to the companies by the headgear: the hunter green and scarlet epaulets; the grenadier epaulets maroon and white; riflemen blue and maroon epaulettes. They all wore blue cloaks as coat collars, cuffs and scarlet capes; ponchos blue and red lining. In campaign and marches chiripaes and scarlet camisoles. 1835. Guardia Argentina Battalion by Guillermo Roux. British Land Pattern "Brown Bess" flintlock musket. ​After the reconquest of Buenos Aires, thousands of these rifles and large deposits with ammunition were captured in 1807 by militias loyal to the crown of Hispania. 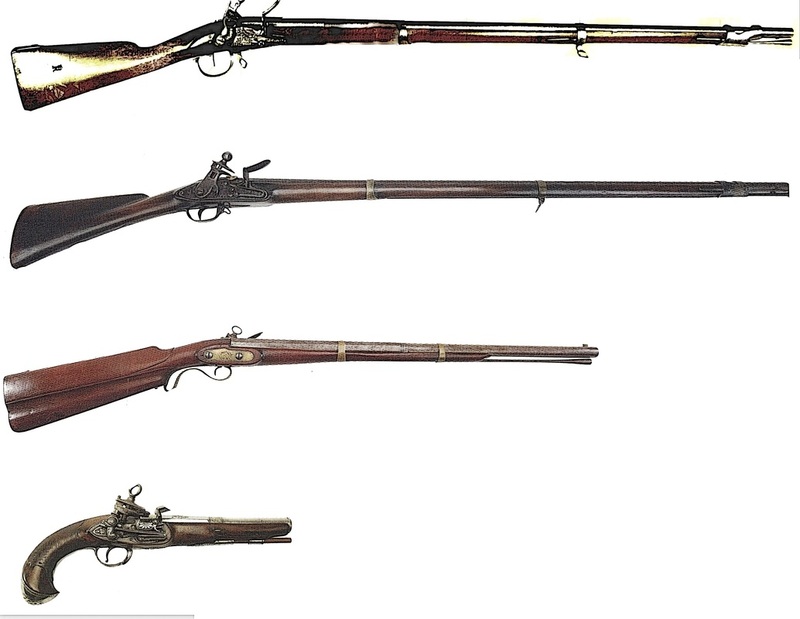 From 1810, these militias formed the independent army, and these British arms became the standard rifle of the Argentine army during the War of Independence, the War against Brazil, the civil wars and the war against Paraguay (War of the Triple Alliance). It is probable that to those quantities of arms captured to the British in 1807, they are added after 1810, other amounts coming from the British aid to the ex-Spanish colonies, to become independent of it. 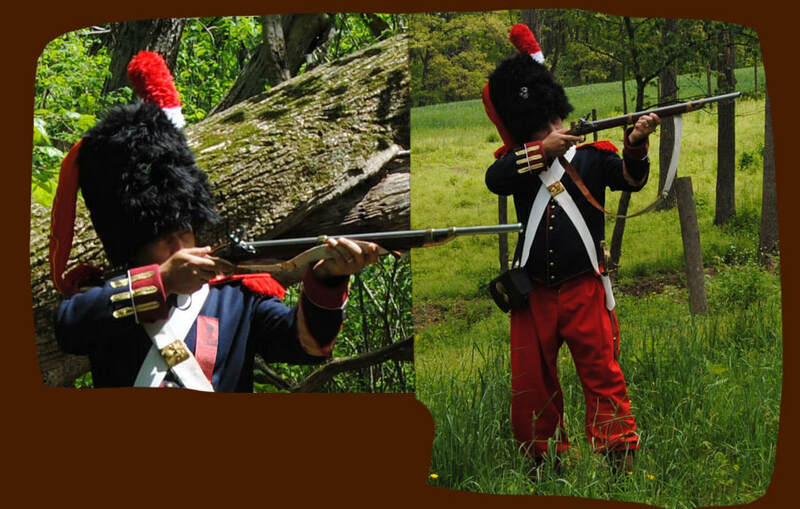 Spanish 1815 Flintlock Musket; 1803 Flintlock Musket. 1775 Carbine-Tercerola. 1800 Miquelet Pistol. British made, double barreled flintlock pistol. Beautiful replica of a Charleville Carbine from the middle of the 19th century. This type of flintlock carbine was extensively used by the cavalries of the XVIII and XIX centuries, which is why it is excellent for historic recreations of that era. Here you see the British Tower. with the Charlevile carbine below. The Charleville carbine is basically a shorter version of the Charleville M1763 rifle. Flintlock Pistol, French Cavalry Model. Replica.